In early August 2016, deep tropical moisture in combination with low pressure unleashed unprecedented historic rain on the State of Louisiana earlier this week. The American Red Cross says this is the worst natural disaster to strike the United States since Hurricane Sandy with over a dozen people dead, more than 40,000 residential homes damaged, and 10,000 people sent to emergency shelters. President Barack Obama has granted the governor's request for an emergency declaration to assist in response and recovery efforts. Gov. John Bel Edwards has deployed the Louisiana National Guard, which mobilized 1,700 soldiers to assist in search and rescue efforts. The governor said he expects to have close to 30 parishes declared disasters -- nearly half of the state's 64 parishes. 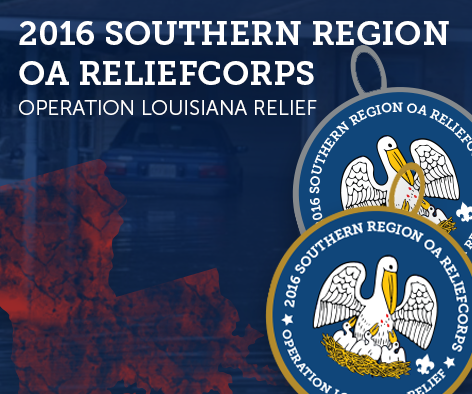 As a response to the disaster, Region Chief Jeff Sedlacek has tasked SR-1A to relaunch Southern Region ReliefCorps: Operation Louisiana Relief. Here is one example of a service project your lodge can perform: organize a group effort to send cleaning buckets: http://www.umcor.org/UMCOR/Relief-Supplies/Relief-Supply-Kits/Cleaning. Additionally, a silver mylar bordered patch may be purchased for $10.00 and the gold mylar bordered service project patches can also be purchased by those wishing to donate $100 to the relief efforts. All proceeds from these sales will be given to the American Red Cross. There is no service requirement to purchase the fundraiser patches. Patches may be purchased and ordered online by clicking the Register button below. All purchased patches will be mailed to the Council Service Center along with the patches from the service project. Please help reach out to the victims of these natural disasters by participating in this program and remember that “he who serves his fellows is of all his fellows, greatest”.